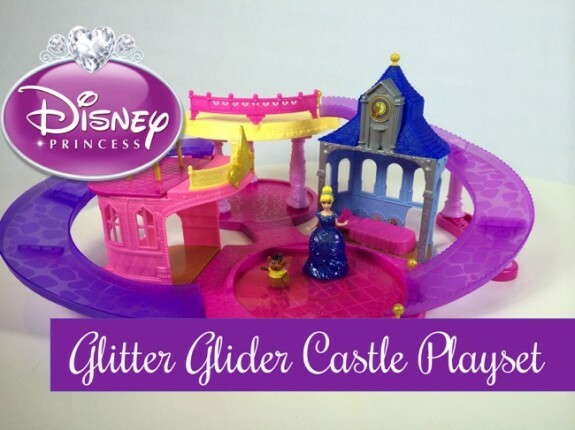 Your favorite Disney Princess can slide, glide and dance with the new Glitter Glider Castle Playset. I had the chance to preview this set at Toy Fair earlier this year and loved its ability to be re-arranged and expanded for increased play. Out of the box the set snaps together easily in less than 20 minutes. Once together kids can determine how they want the castle set up. 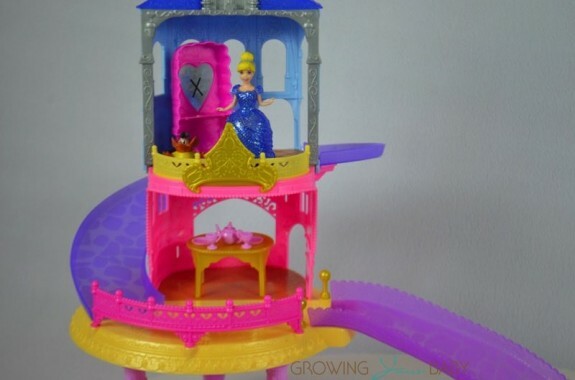 The Glitter Glider Castle comes with Cinderella, her trusty friend Gus, a dining room, table with plates, cups and a tea pot, Cinderella’s bedroom, her bed(which doubles as a wardrobe), two glider tracks, a ballroom dance floor and a courtyard. Cinderella can get ready in her bedroom, slide down to the dining room – have dinner and then slide down to the ballroom dance floor. Once they’re on the dance floor kids can press the lever on the side of the unit to make both characters ‘dance’ around the floor. The dolls that accompany this set use the MagiClip dresses that allow for quick and easy outfit changes. 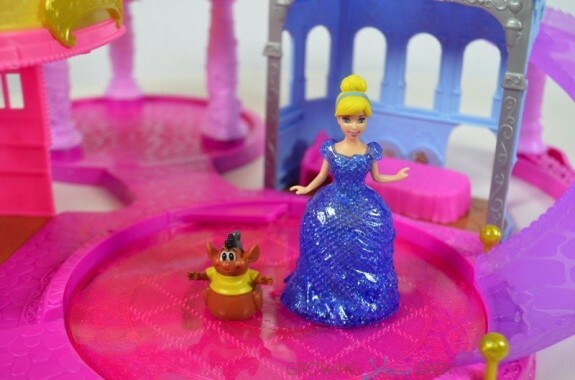 The characters that are designed specifically for this set also have wheels on the bottom of their dress to allow them to glide down the staircases, and the pets have a silver ball in the bottom, which gives them the ability to move easily as well. 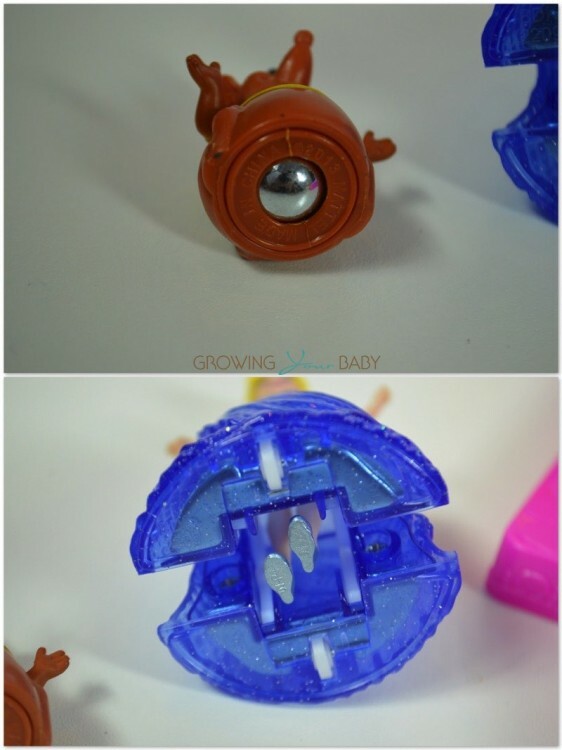 Regardless of the age range of the child that we tested this toy with – it was a hit with everyone. The one thing that impressed me was that the princesses slide down the staircases – flawlessly every time. Sometimes you see that they trip on a seam of that they move too quickly and fall over, but this isn’t the case. Once the set it together it is also very easy for little ones to move it around to be in the configuration that suits them. 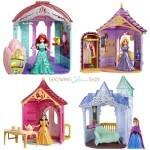 Kids can also add additional playsets and Princesses to create a whole world of wonder. Mattel offers sets that include Belle, Ariel, Anna and Rapunzel. We have put together a video to show off some of the features of the set!